← If you could have only one…. 38 years ago, the world discovered that golf no longer meant a game played by surgeons and lawyers. Volkswagen needed a replacement for their iconic Beetle. They had tried previously to change it, but enthusiasts would hear nothing of it. Then, in 1974, they decided to launch the Golf. Sure, the Beetle was still being made for nostalgia reasons, but the Golf was aimed at what the Beetle stood for: A small, affordable, reliable and practical car to power people, and motorize a whole generation. With its gorgeous body designed by Giorgetto Giugiaro, it was an instant success, following up to the three most famous letters in the alphabet: GTI. The Golf now was synonym with practicality, and, just like the Beetle was the definition of a car to a whole generation, the Golf became synonymous with the word car. As they say, the rest is history, and the Golf grew to become one of the iconic cars of the 20th Century. Sure it was not all rainbows and roses, the Golf history is full of ups and downs. It all started with the uproar by fans when the Mk2 came out. The Mk2 may have been an excellent car, but it started the steroid trend of making each generation bigger than the last one. It was not all a loss though, each new Golf was more sophisticated, more comfortable, more practical. The sacrifice though was a big one, as newer versions became less fun. The Mk3 got even bigger, to the point where VW had to put a 174bhp VR6 engine, just to get the fun factor of a small 112bhp Mk1 GTI back. This culminated with the Mk4, which is also known as the least reliable Golf of all time. Sad… (though VW did make up for it with the R32). With the Mk5, though, VW claimed to bring the fun back, and its claims seem to have been well founded with the latest incarnation of the GTI. The only issue was, that version was the most bloated Golf ever. However, with the Mk6, people started to lament on the lack of evolution in the design, and with the announcement of the latest version of the Mk7, the lamentations seem legitimate. To someone who knows nothing about cars, the Mk7 looks just like a Mk6 Golf. The problem is, VW design language is all about evolution, not revolution. If people like something, why change it? 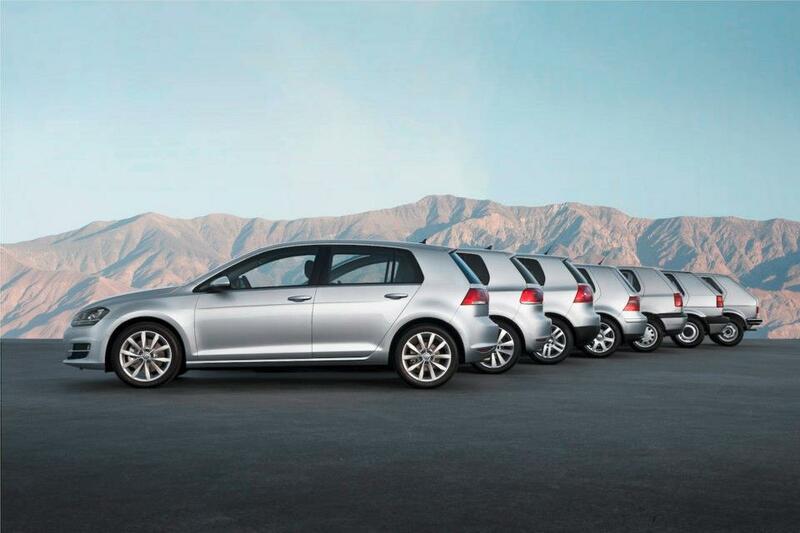 The reason VW can get away with only very mild changes to the exterior, is because they got it right the first time. Renault had to change its Megane completely because the version before it was a bit shocking. Now people say the latest version looks too much like a Golf. Guess what, the Golf is a benchmark, other cars can only compare themselves to it. The fact is, the Golf still remains one of the most sold hatchbacks in the world (almost 30 million cars sold so far), and the reason people buy it, is because they know exactly what they are getting: a car. The Golf is not a statement like a Citroen DS4, it is not spaceship like a Honda Civic, nor is it also a disappointment like a Peugeot 308. Yes, it does mean that the Golf is boring, but so is another VW product: The Porsche 911. The thing is, the design of the Porsche 911, just like the Golf, has only evolved in 49 years, not changed. Personally, I cannot tell the difference between a 997 and a 991 from the front. The reason why the design never really changes, is because Porsche got it right the first time. Now, all other sports cars are compared to the 911, it is the benchmark, just like the Golf. That said, saying there is no change in the Golf is about as true as Weapons of Mass Destruction. For one thing, the Mk7 Golf is the first VW car on VAG’s new MQB platform. It is the same platform as the Audi A3, but the beauty of that platform, is that it allows endless customisation. No wonder almost every car in the Volkswagen group will be using it soon! What this means also, and this is a first for almost 25 years, is that the new Golf is lighter than its predecessor! 100kg lighter to be precise. It may be bigger, more comfortable, more refined and all, but it can pull it off! The sharper styling helps conceal the bloated look a bit more, and the fact that it is lower than the Mk6 adds to that effect. Compared to this, the Mk3 looks very fat! Because of the bigger size, the interior will be roomier and more comfortable. The redesigned dashboard looks great, even if a bit bland. But it is bland for a reason, the same reason the car never really changes on the outside, as it is made to please everyone. Red trim excites a few, grey trim is accepted by all afterall. As always, with a new Golf comes new toys. In terms of equipment, expect to find a new infotainement system with a huge touch-screen, wifi capability, and an electronic parking brake. Overall, the Mk7’s cabin will be a much better place to be. In terms of engines, the usual range of petrol and diesels will be available. Where it gets interesting, though, is that the new R version will have a 276bhp 2.0l engine, and the usual Haldex four-wheel drive system. So there we go, the new Mk7 Golf, same on the outside, even if all is changed underneath. Just like the 911. And no one really complains about that, do they? This entry was posted in News and tagged a3, audi, golf, gti, mk1, mk7, mqb, porsche, volkswagen. Bookmark the permalink. It is pretty, the only downside is that I find it unfortunate that the motor does not give it a little more power. 240-250 hp would have been better because the future Golf R should surely not be far from 300.